A Florida resident says he “couldn't watch America's symbol die” as he witnessed an epic battle between an alligator and a bald eagle. When things started to go the alligator’s way, the man intervened and ripped the eagle from the gator’s jaws. As the battle unfolded in his backyard with the bald eagle losing, David Anderson of Parrish, Florida decided to take matters into his own hands by jumping into the water to try and prize the eagle from the jaws of death, he told Fox News. 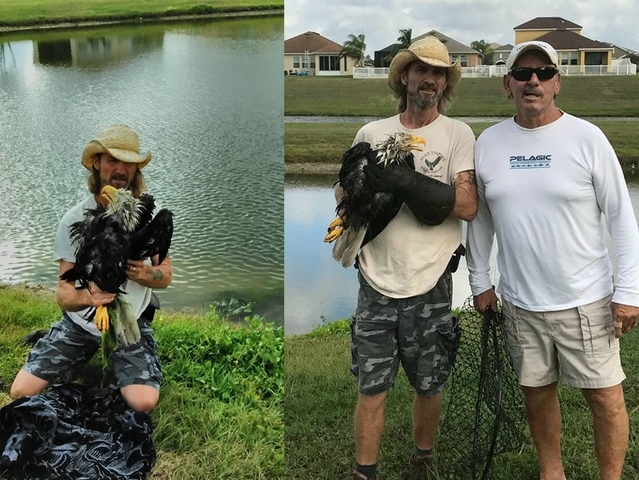 Once he had successfully fought off the gator, he contacted local wildlife rescuer Justin Matthews to try and save the eagle’s life. “It actually brought a tear to my eye, that he would do something like that,” Matthews said. He was also quick to point out on social media that not only is Anderson brave for taking on a gator but he is also currently undergoing chemotherapy for leukemia. The eagle was hunting around the pond to feed its family, nesting on a nearby cell phone tower on Harrison Ranch, when the gator struck suddenly. "It's our bald eagle. It's our treasure," Anderson told Fox 13, elaborating on the reasoning behind his brave act. "It stands for who we are and what we are." Gators in the backyard are nothing new for Florida residents but Anderson’s bravery has earned him plenty of praise online. Responses to "Man ‘couldn't watch America's symbol die,’ risks life to save bald eagle from gator’s jaws "